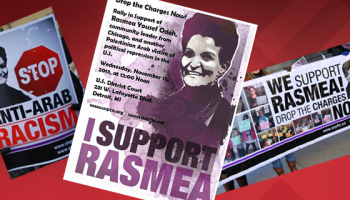 Fellow Chicagoan Rasmea Odeh was sentenced Thursday following a jury's verdict that she lied on her application to become an American citizen. Though she's appealing the ruling, the judge stripped her of her U.S. citizenship, sentenced her to 18 months in jail and ordered that she be immediately deported afterwards to Jordan. Her crime? Falsely claiming she had never been convicted or imprisoned. Ever. Answering that question truthfully is especially important post 9-11, particularly when the conviction and imprisonment was for terrorism. Odeh failed to reveal her conviction for masterminding a 1969 Jerusalem supermarket bombing that killed two university students. For good reason, everyone's immigration and visa application requires disclosure of previous arrests, convictions or imprisonment. Not answering honestly is itself a criminal act. Her lawyers and supporters are continuing to depict her as a veritable saint and an innocent victim of America's legal system. Their well-worn narrative of a noble, grandmotherly community activist and an unwitting casualty of an evil judiciary has become a familiar trope. And yes, somehow, despite the law being crystal clear and common sense – don't lie on U.S. immigration applications about your criminal past – critiques of Israel and U.S. support for Israel are disgustingly part of their surreal script. 1) Mention of, never mind mourning for, the murdered grocery-shopping students, Leon Kanner, 21 and Edward Joffe, 22. 2) That Odeh was an active organizer for the Popular Front for the Liberation of Palestine (PFLP), designated by the U.S., Canada, and the EU as a terrorist group. Odeh recruited others, including her co-conspirators in the grocery store attack. The group's very purpose and primary activity was attacking Israeli civilians. Bombing a grocery store was a "normal" activity for her and for them. Hence, no one was surprised when, after the grocery store attack, extensive bomb-making material was found in Odeh's bedroom or when the PFLP named new terror cells – including a notorious one that hijacked airliners – in her honor. 4) A 1980 article in the Journal of Palestine Studies quotes Odeh discussing her involvement in a subsequent bombing at the British Consulate in Jerusalem. "Actually we placed two bombs," she said, "the first was found before it went off so we placed another." 5) Even her defense attorneys acknowledge Odeh violated court orders during the trial and that the jury's verdict indicates they – like the government – conclude she perjured herself during her testimony. 6) While her defenders predictably depict her conviction in an Israeli courtroom as unjust, a credentialed International Red Cross observer stated that she and her lawyer were afforded every chance of defending her, and that she was given a "fair trial." Moreover, her and her accomplices' subsequent admissions outside of that court re-confirm her guilt. Leon Kanner and Edward Joffee, the two university students who went out for some groceries in Jerusalem 46 years ago (and their families) are the victims in this story. Odeh is not a victim. She is a proud terrorist who was afforded every opportunity to defend herself in Israeli and American courts. Americans – like Israelis – put faith in our judicial system to provide those safeguards to the accused. Such rights are extended, appropriately, even to those who lied in order to achieve the very citizenship that affords them those liberties. But we also put faith in our judicial system to protect us from terrorists, even those deceptively depicted as huggable and harmless as was Rasmea Odeh. The real, twice convicted Odeh, a terrorist, is going to where she belongs: in jail, followed by deportation from the country whose freedoms she exploited in order to live here illegally for two decades. That's a harsh, but accurate picture. Jay Tcath is Executive Vice President of the Jewish United Fund/Jewish Federation of Metropolitan Chicago.